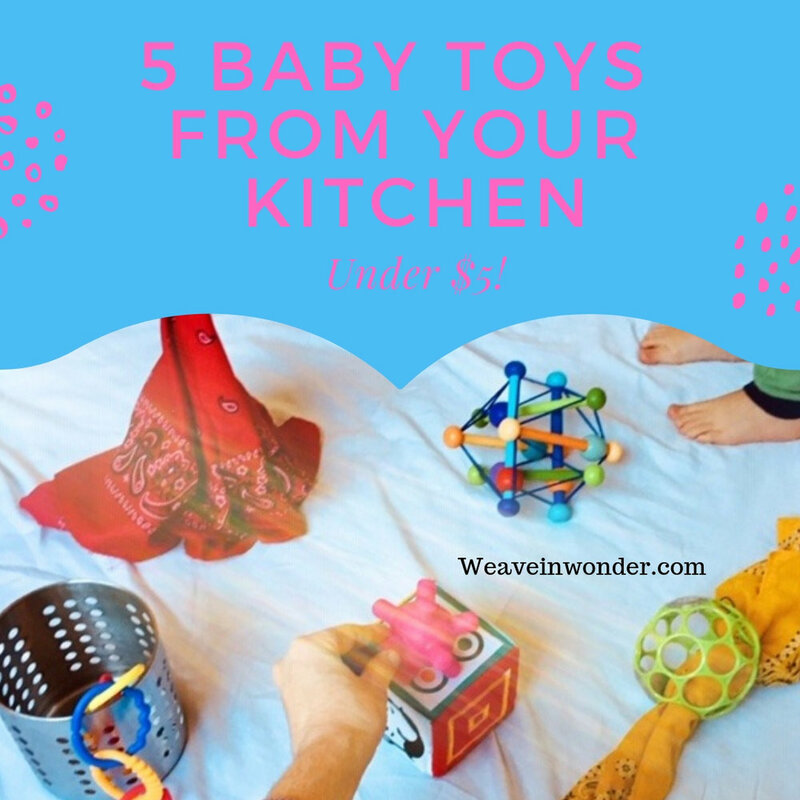 Finding baby toys for babies and toddlers can be as simple as opening up our kitchen cabinets. In this post, I’m sharing 5 toy ideas that are simple to find and set up. Each “toy” invites babies and toddlers to discover and learn in many different ways. Have I mentioned that each toy idea is under $5? Woop woop! There, I said it. Simple toys really are the absolute bomb! Though, I have purchased my fair share of gadgets too before I wised up. I’d search toy stores for the most educational looking toys that could entertain my baby the longest. I thought they might somehow make my baby an advanced learner, only to discover that many gadgets marked “educational” teach a very limited skill. Not to mention, can create passive and sometimes over-stimulated babies. We often forget that the simple toys provide the most independent play, imagination, creativity, and problem solving - not to mention build social skills when played with in a group. As I learned more about the RIE® Educaring Approach through books and then later through my certification, I felt inspired to try a few toy ideas with Magda Gerber’s advise in mind. She told parents to look for toys that are “baby activated” instead of battery-operated. Many of her suggestions were luckily in my kitchen cabinets. Sweet friend, have you sat quietly and observed your baby play with a simple “baby-activated” toy? What do you notice? If you’d like, observe your baby play with a battery-operated toy. Which get played with the longest, and offer the most variety of ways to play? I’d love to hear your thoughts below. Because our babies are laying on their backs (here’s what to do if you’ve been sitting your baby up), it’s a good idea to stack two simple objects together, or elevate an object so that it’s within eye level. For example, this might be, a soft block with a muffin cup on top. A lightweight metal container with teething beads dangling out. Or taking a handkerchief and forming a peak so it’s easy to grab. These examples are pictured above. You can get creative - it’s fun! Showing and then stacking it next to our babies offers a choice, and is at the right height for seeing and grasping. It also encourages free movement, and turning and eventually rolling when they are ready. We can then sit and watch, and appreciate what our children do. We might soon notice that holding back from showing how to play with a toy offers an opportunity for more creativity and problem solving skills. Our babies may pick it up and explore in a creative way, or decide not to. He might decide instead to look out a big pretty window and play with his own hands. Either way, we trust whatever our children choose to do is absolutely perfectamundo! They are learning something new each day and nothing needs to be forced. Plus we learn a little more about our babies and their interests in a relaxed and open way. Big bonus: We’re not getting sore arms by dangling toys over their heads, and we’re saving money by skipping past the elaborate playgym and exersaucer aisles. Those devices may be popular, but really not needed. Handkerchiefs (pictured above)- Our baby’s first toys are often his own hands. A handkerchief or dinner napkin makes for a beautiful second baby toy when they are ready. They are lightweight and come in a variety of colors and patterns. Handkerchiefs can be weaved through an Oball for easy grabbing and won’t roll away. They can also be air dried for more stiffness, and then pinched into a peak for easy reaching. I’ll never forget observing a baby in an 1.5 hour RIE® baby class play with one handkerchief in many different ways the entire class, including waving it around and playing peekaboo. Muffin cups - These flexible, silicone cups are BPA free and can be interesting for babies to explore. For babies, stacking one on top of a soft block, or even stacking two together so that they can see and grab, is a great option. You can keep these baby toys in your toy rotation for the toddler years. They are great for imaginative play in a play kitchen or sandbox. Metal containers and bowls - (pictured above) Shiny objects offer a little bling and extra interest for babies to play independently. Sunshine can reflect some beautiful light around the room which your baby might notice. You can try out different weights, sizes, and shapes. You might also want to dangle teething beads or plastic chains out. Save them along with your muffin cups for the toddler years. Measuring cups and spoons - These make interesting sounds and are lightweight if you stick with plastic or silicon. They come in different colors and you just want to ensure the metal clasp is secure to prevent it coming loose. You can dangle spoons out of a container to bring it at eye level, or place a measuring cup on top of a soft block so that it’s at the right height. Water jugs - These are fun for crawling babies who are able to get into a sitting position themselves, and of course for toddlers too. They are clear, light weight - and I wonder what can fit inside? In my RIE training, my mentor showed me how to set out plastic hair curlers in different colors in a metal bowl next to the water jug. Some fit in, and some don’t, and that’s intentional! There is no need to rush providing this play idea if your baby isn’t getting into a sitting position herself. The downsides to propping up our babies to play do not make it worth the rush. Instead, wait for readiness. Trust that our babies can learn how to sit up on their own when they are ready. For both of my children, they learned how to get into a sitting position themselves after crawling, but this isn’t true for every baby. Your baby will have her unique timetable and that’s a beautiful thing! I hope you enjoyed this post! I’d love to know, what toys can you find in your own kitchen? Are there other “toys” your children like to play with that are not really toys? Comment below!